I've seen scenes in this movie multiple times in multiple movies, yet I've never seen this movie before. 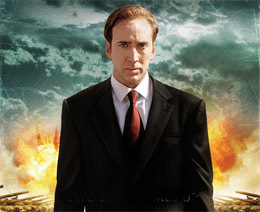 Andrew Niccol's "Lord of War," is the story of the rise and decline of an arms trafficker (Nicholas Cage) and takes many predictable narrative steps. It is a list of cinematic clichés, from the personalities (even the names) of the characters, to the moments of suspense and surprise, to the preposterous ethnic stereotypes. It contains everything short of a protagonist dangling from a cliff or a racing bus driving through a fruit stand. Further, there is very little character development, very little revelation, and most of the characters are caricatures. Nevertheless, the final product is a thoroughly original, provocative satire that explores a violent decade of global peace and haunts you with an almost silent sinister laugh. Artwork and page design by Marie Haws. The central question of the film is the moral question: can you sleep at night, knowing the way your choices harm other people? Niccol answers this question through a number of characters: two arms dealers, two military officers, a religious man, a fashion model, a dictator, a cop, and a wild eyed younger brother. We know that everyone has a value system of some sort. We expect politicians to lie and we get ourselves in trouble when we start believing them. We expect preachers to sacrifice, and get furious when they exploit. The consistent answer for most of characters in this film is: yes I can sleep at night, by living in denial, until those choices catch up to me. In some cases in this film, the choices do catch up to the culprits. But only in some cases. One arms dealer (Cage) seeks to be the best at selling guns, while another dealer (Ian Holm) consciously seeks to change governments. We see that the result is death, not only of soldiers but civilians, including a whole mess of children. 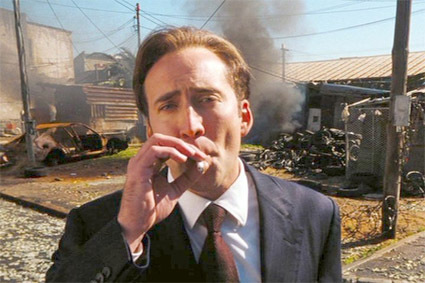 Cage does not take any blame for the murders; in his elaborately calculated outlook, he is only selling product, but refuses to let his own son own a toy gun. Holm seeks the greater good, which translates as victory for his side, knowing that bullets travel faster than ballots. The military officers need to pay their own bills, and in some cases must support their nations, but they illustrate that their service and perhaps their loyalty can be purchased. A religious man - Cage's father - is Catholic, yet takes on a Jewish persona in every aspect of his life. Is he a fraud, if he believes in it? A fashion magazine cover girl (Bridget Moynahan) lives a bored extravagance as she invites us to appreciate her slow motion beauty, and minimizes it as "wearing clothes for a living," though we know her profession contributes to the damaged minds and bodies of countless women and girls. 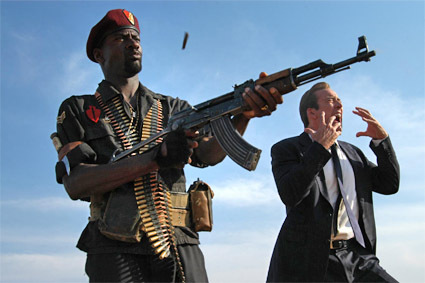 An African dictator survives as the fittest, and thus cares little for his citizens, for his staff, for life in general; he blames MTV for society's collapse, but raises an army of "Kalashnikov kids" whose bullets are just as effective as adults'. On the flip side, a government cop (Ethan Hawke) cannot be bought. He follows the law to the letter, and exercises it to the maximum, but does not dare break any rules. Meaning, he is a frustrated idealist. But, morality and legality are different, and he crosses every rule of cordial conduct. And, last, Cage's little brother (Jared Leto) is the film's conscience, who hides from the world's nastiness through wine, women, and cocaine, until those appetites fail to shield him. Released in 2005, while we were knee deep in the so-called Global War on Terror, the film's landscape is to some degree the human conscience and to some degree war. In terms of its own context, the Cold War has ended, opening the gates toward some sort of global peace. The open secret, however, is that even if the hair-trigger stalemate has finished, every corner of the globe continues to get riddled with bullets that are more plentiful than pennies. In terms of philosophy, War is itself the greatest challenge not only to systems of morality, but also to business. No religion preaches war, yet all religions confront it, and frequently believers embrace it, even if they do not call it "war." Similarly, the most successful businesses tend to be those that provide the most service, but the war profiteers tend to seek quick benefit in a market - merchandising death - that would theoretically eliminate itself once everyone has died. Further, with War, we have the problems of cultural assumptions: simply "we" are civilized and "they" are savages. The salesmen and customers in this film dress in very nice, polished attire, and are sometimes also the shooters. Perhaps in our culture, however, we would rather believe that a bearded man in a cave would seek personal religious profit by making us bleed, rather than accept that a former Secretary of Defense, or a CEO of a war profiteering oil service company, or a Vice President would seek personal material profit at the cost of our blood. Whether or not War is ever justified, it is always a bitter reality that we often tend to hide from. But, even those of us who protested publicly or privately that the current war is a scheme for energy resources, we are the beneficiaries, so how many of us honestly changed our energy consumption significantly? Maybe a few of us. Maybe not. So, as we quietly bang the drums of war toward an inevitable assault on Iran, the first question is: who will pull the trigger first. But, the second question is: how long will any of us care, for the returning soldiers and the ignored civilians in Iraq are still wounded and still ignored. But, the question the movie tells us we should ask is: who profits? If the movie is preaching a clear message, then it is, in Michael Corleone's words, that we all part of the same hypocrisy, but only some people admit it, while most of us live in denial. The year 2005 was a huge year for some very great criticisms of war and state, including "Syriana," "Kingdom of Heaven," "Munich," and "Good Night and Good Luck." Unlike these others, however, this film is a satire. It coldly haunts us when it boasts that the leading dealers in arms are nations, starting with our own. And, it casually laughs without telling us anything we can do about it. Next Article: Tender Traumas of Helplessness Previous Article: Do I feel lucky? Well, do ya, punk?